This book is one of three that are one of the many listings in the online auction taking place from May 14, 2016 and continue until midnight EDT, May 20, 2016. Get all the details about the auction on the auction page on the EAC website. 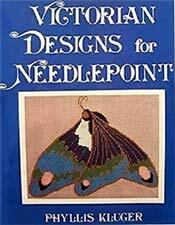 Printed in sepia ink on off-white paper, this handsomely designed book is another of the season's many distinctive needlepoint offerings. Kluger has found her inspiration in disparate British and American sources, both expected--a bit of Crystal Palace carpet--and less likely: a Paine's Celery Compound label. Several geometric ones--a Pennsylvania railroad bridge, an Eastlake parquet floor--could be handled by beginners; most are more difficult and a few (including a Hiroshige print of moon, waterfall, and maple) will challenge the most experienced hands. In most cases, the adaptations work well: the William Morris patterns are easily accommodated, and some Frank Lloyd Wright tilework transfers surprisingly well (although the diagram could be enlarged). Also, a gingerbread house (taken from an 1850 copy of the original), some iron tracery from Chicago's Rookery building, and a simple beadwork pattern derived from an 1847 book. A few designs are less attractively adapted but the book itself is an admirable piece of work: Kluger strays from the original colors but not from the Victorian palette, the designs convey a Victorian sense of decoration, and her asides are diverting.